The development highlighted ongoing efforts by both sides to develop collaboration in this realm. Last week, Vietnam and Laos carried out another joint patrol between their border guard forces. The interaction was part of a regular stream of meetings held between the two countries on this front, but it nonetheless held significance as it illustrated the continued importance of border issues as part of the broader relationship between the two Southeast Asian countries. As I have noted before, border management remains a key issue in the Vietnam-Laos bilateral relationship. It is a means through which both sides can promote border trade while also managing transnational challenges, such as drug trafficking or migration, that continue to be difficult to confront. That aspect of defense collaboration has continued to be advanced over the past year or so. Indeed, in December 2018, when both sides held an annual iteration of a border meeting, they took stock of ongoing collaboration, with areas such as the development of an inland border gate system and joint efforts in upgrading existing border markers and adding new ones, while also discussing priorities for 2019, including addressing undocumented migration and managing border gates. Last week, this aspect of Vietnam-Laos security ties was in the headlines with the conduct of yet another joint border patrol. The patrol occurred between the two sides on March 23 in line with the long-established protocols and procedures. 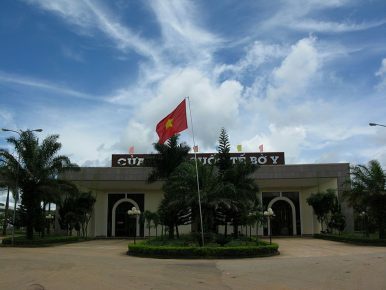 Per Vietnam’s defense ministry, the patrol was conducted by the Tri Le Border Post of the Nghe An provincial Border Guard Command and militia force of Tri Le commune of Que Phong district, in association with Lao forces from Border Guard Company 217 of Laos’ Houaphanh provincial Military Command and militiamen of Daend in hamlet of Phanthong hamlet grouping of Kone district. As is usually the case with these joint border patrols, the event was designed to advance shared priorities, including detecting and resolving law violations along the borderline, enhancing collaboration to protect the shared border, and contributing to maintaining political security and social order in the border localities of the two sides. During the two-day program, the participating forces patrolled the shared borderline between the two border markers of 376 and 377, with the patrols being carried out in line with both sides’ border protocols and procedures. Following the end of the patrols, the participating units reviewed the outcomes, signed the program’s minutes, and rolled out plans for the next event. Unsurprisingly, not much more in the way of specifics was disclosed by either of the two sides. Nonetheless, the shape of this collaboration will continue to be interesting to watch in the months and years that follow, and amid wider domestic and international developments.